Questions about Colin Kaepernick's ability to lead the 49ers in the playoffs were brushed aside with alacrity in last Saturday's emphatic victory over Green Bay. Kaepernick dominated the game from start to finish, landing blow after blow with his legs until a 56-yard touchdown run sent the Packers packing back to Wisconsin and broke the quarterback playoff rushing record in the process.  As Brian noted at the New York Times's fifth down, Kaepernick is the main reason San Francisco gives a substantial 4.5 points at the Las Vegas books despite playing at top seeded Atlanta in the NFC Championship. The 49ers' solid conventional running game and excellent defense would have made them a formidable matchup for the ever-questioned Falcons with Alex Smith under center. Kaepernick's dynamism in the running game makes San Francisco a nightmare. The zone read and other designed quarterback running plays -- such as those out of the pistol formation -- have used Kaepernick's speed in a wildly successful fashion. Including the victory against Green Bay, Kaepernick has used designed runs 35 times and picked up 351 yards and 21 expected points added, an absurd 0.6 expected points added per play. Marshawn Lynch had 19.6 expected points added this season on 315 rushing attempts. Kaepernick piles on the big plays. Only 41.4 percent of rushing plays have gone for a positive EPA and only 9.2 percent have gone for more than plus-1.0 EPA. 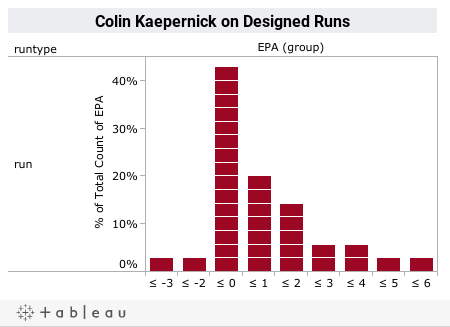 Among just Kaepernick's designed runs, 57.1 percent have been positive by EPA. Most impressively, 11 of his 35 (31.4 percent) have been worth at least a full expected point added; four of the 35 (11.4 percent) have been worth more than three. But, even if the Falcons can stop Kaepernick out of the pistol or zone read or other designed runs -- and they haven't stopped quarterbacks running yet this year -- they still have to deal with his legs after he drops back to pass. Kaepernick's passing ability is dangerous enough -- including the playoffs, his 6.7 AYPA leads the league. Add in his legs and it makes truly covering the field nearly impossible. Kaepernick has busted out of the pocket 29 times for 244 yards, picking up 8.4 yards and 0.39 EPA per scramble. Kaepernick's scrambling results don't differ much from the league at large, which picks up 7.2 yards and an equal 0.39 EPA per scramble. But unlike most quarterbacks, Kaepernick is able to use it relatively often (nearly three times per game) and without taking sacks. Kaepernick has been sacked just 17 times, or once for every 1.7 scrambles. The typical quarterback takes a sack once every 0.6 scrambles. As clearly as the designed runs hurt the Packers in the divisional round, Kaepernick's ability to scramble seemed to change the game's dynamic the most. If the Packers brought pressure, he could run past it. If the Packers held coverage throughout his progressions, even more of the field would open up. And, of course, when neither occurred, Kaepernick would just beat them through the air. The combination of a road NFC Championship game and a quality Falcons squad opposing Kaepernick could be enough to finally shut him down; the presence of Matt Ryan on the other offense could sink the 49ers even if he has another sharp game. However, Kaepernick's robust presence in the 49ers offense on top of their already apparent talent on both sides of the ball gives them a clear edge. Expect his legs to be a -- if not the -- deciding factor in the game once again this week.